Joey Sanfilippo (track) — Sanfilippo won the 100-meter dash title at the ShareSLO.com Invitational in March. 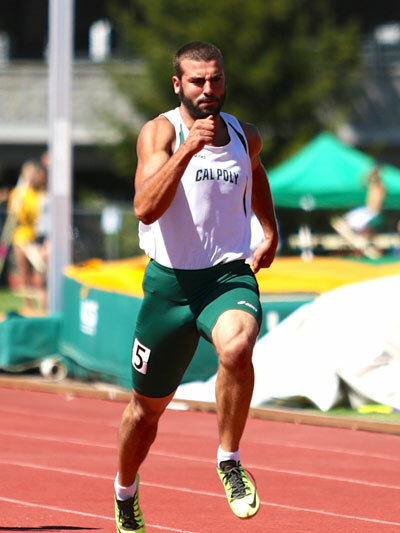 He also captured the 100-meter title during Cal Poly’s Blue-Green dual meet versus UC Santa Barbara. Sanfilippo finished eighth at the 2015 Big West Conference Championships. During season, he also achieved his career best time of 10.70 seconds for the 100 meters, set on March 29, 2014. Mitchell Martin (men’s golf) — Martin ended his sophomore season on the men’s golf team with an average of 74.0 strokes per round. He recorded three top-20 finishes, seven rounds of par or better, and three rounds in which he hit in the 60s. Martin finished second in the Nick Watney Invitational hosted by Fresno State and tied for third in the El Macero Classic hosted by UC Davis. Alex Vega (football) — A kicker, Vega joined the football team as a walk-on for spring drills and has made the 95-man roster. He is listed No. 1 on the 2015 preseason depth chart for kickoffs as a redshirt freshman. Harry Whitson (football) — Whitson was a redshirt for the 2014 football season and is listed on the 2015 preseason depth chart as a backup center on the offensive line. Luke Wilson (wrestling) — Wilson has missed two seasons due to injury. But the Mustang coaching staff are hopeful that Wilson will challenge for the starting nod at 167 pounds next season as a redshirt sophomore.